A little top-down cap in Italian wool from Ebay...nice and soft. I am trying to improve my two-handed stranding. Everyone in my knitting class who knits continental tensions the yarn by holding their index finger pointing to the ceiling...this is uncomfortable to me so I have been trying other solutions. 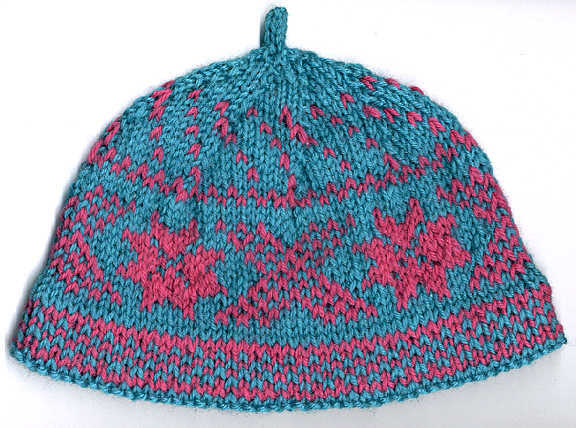 Finally found one I like while watching Elizabeth Zimmermann in the Knitter's Glossary video. Her index finger actually appears to rest on the needle...just what I was looking for! Put a hem in at the bottom just for the fun of it :-) Now I just need to throw it in the machine and block it...No pattern available.